The flexible nature of the durable brush tip aids itself to both the blending and filling of large areas, as well as to fine detailing and highlighting. 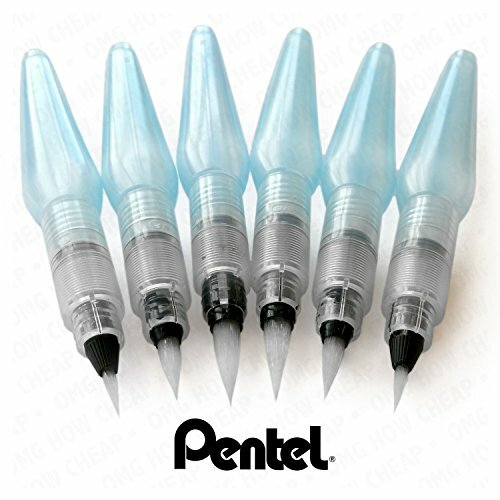 The Aquash Water Brush Pen from Pentel, featuring an extremely durable nylon brush tip, and a large transparent body with a 10ml water capacity. With a cap that allows for water to be transported in the reservoir, the Aquash Water Brush pen is the easy way to blend, shade, and highlight when away from the home or studio. Perfectly suited for use with watercolour paints, crayons, and pencils. Pack contains two of each of the following tipped brushes: Fine, Medium, and Bold. If you have any questions about this product by Aquash, contact us by completing and submitting the form below. If you are looking for a specif part number, please include it with your message.